EARLY reports characterizing the voters who turned out on Tuesday have been quick to frame the overall election results as a tie, with more or less equal advantages for Democrats and Republicans alike. Much of the media breathlessly bought into this narrative. But after a closer breakdown of who turned out on Tuesday, it’s clear that, to paraphrase Mark Twain’s long-ago observation, reports of a stalemate in the 2018 midterm election are greatly exaggerated. In all the cohorts that matter, the Democrats expanded the electorate. The Republicans did exactly the opposite. That’s why the Democrats carried the day. The outcome of the election should be a wake-up call for Republicans eager to be competitive in 2020. All in all, Democrats gained 31 seats in the House of Representatives, well above the 23 needed to control the chamber. And Democrats captured 323 state legislative seats, six state legislative chambers and seven governorships. Dems flipped three state Supreme Court seats, and shattered GOP state Senate supermajorities. “Stalemate”? “Gridlock”? One begs to differ. There’s any number of reasons. It didn’t hurt that millennial culture icons like Rihanna and Taylor Swift came out early calling for young people to register. 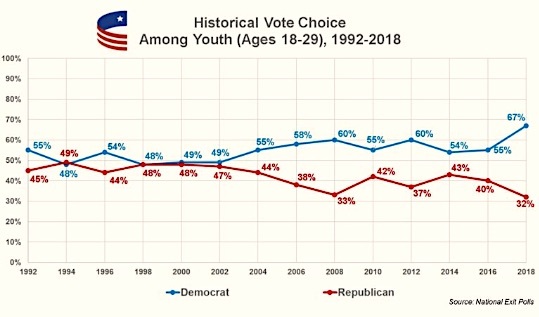 But also, younger voters were apparently motivated by a broad range of social issues, including gun control, the economy, and a desire to stop President Trump from breaking the constitutional furniture. WHATEVER it was worked. "In an overwhelming number of races, according to the exit polls, the Democrats won the younger vote – folks under the age of 45 – and they lost folks over the age of 45," John Della Volpe, director of polling at the Institute of Politics at Harvard University, told USNews & World Report. 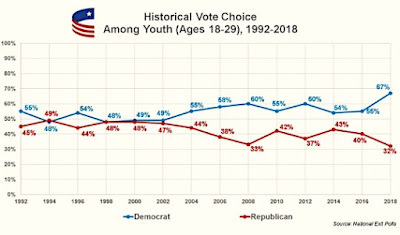 CIRCLE data support Della Volpe’s assessment: 67 percent of young voters went for a Democratic House candidate, while 32 percent voted for a Republican House candidate — a divergence of affiliation that’s held true in CIRCLE data since 2002. "This was very much, I think, for young people, a rebuke of the first two years of an administration that they don't see as sharing their values," Della Volpe says. Let’s look at the racial breakdown of midterm voters. Citing exit polls, Pew Research Center reports that “Blacks overwhelmingly voted (90%) for the Democratic candidate [in their district], including comparable shares of black men (88%) and black women (92%). “As was the case in the 2016 presidential election, white men voted Republican by a wide margin (60% to 39%) while white women were divided (49% favored the Democratic candidate; as many supported the Republican),” according to Pew Research Center. A Pew poll from Nov. 2, four days before the election, found the likelihood of the same results among Latino voters. “More Hispanic registered voters say they have given ‘quite a lot’ of thought to the upcoming midterm elections compared with four years ago and are more enthusiastic to vote this year than in previous congressional elections,” Pew reported. Sentiments are more concrete among Latino registered voters, but no different in the allegiance they reflect. “Hispanic registered voters affiliate with the Democratic Party over the Republican Party by a more than two-to-one margin,” Pew reported on Nov. 2. WOMEN? According to Pew data, “women college graduates stand out for their strong preference for the Democratic candidate [in their districts] (59% favored the Democrat while just 39% voted Republican). Whites with less education – particularly men – supported the Republican. White men who do not have a college degree voted Republican by about two-to-one (66% to 32%). It’s disparities like these that had a lot to do with the outcome of Tuesday’s election. Republican analysts and strategists have a lot to think about in the wake of the midterm vote. The task of closing or at least narrowing the gulfs between one cohort of American life and another, between one style of governance and another, should keep them busy for some time to come — specifically, the 726 days until the next election. 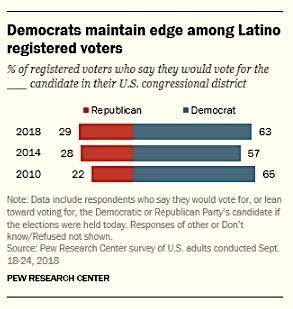 Image credits: Latino registered voters chart and Pew Research Center logo: © 2018 Pew Research Center. Youth voting preference chart and CIRCLE logo: © 2018 Tufts University.